Tous les Jours (TLJ) is a French-Korean bakery serving a unique selection of bakery goods and beverages, that are made from all-natural ingredients to ensure fresh and high-quality flavors. Last August 25, 2014, Tous les Jours opened up its 14th store at the Lobby Level of Trinoma to fulfill the cravings of Filipinos for authentic and indulgent breads and cakes. "Tous les Jours is the definition of the perfect baked treats: fresh, delicious, and healthy. And we are happy to reach more and more patrons in Metro Manila," said Ms. Andrea Amado, President of Everyday Fraycheur. During their store opening in Trinoma, we were treated to a bread and pastries buffet of TLJ's best-selling treats. 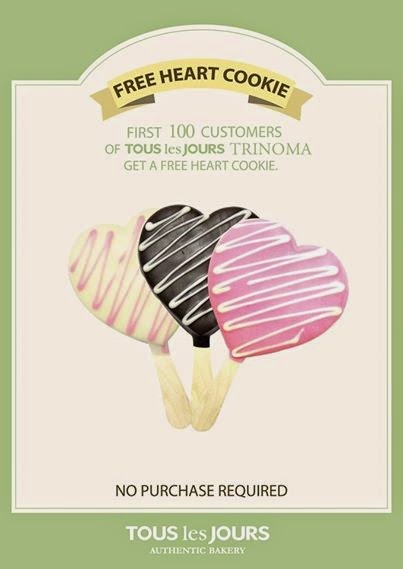 Aside from that, they also gave away free heart cookies to their first 100 customers. My favorites among all the breads I've tried were the Sweet Black Rice Bread w/ Black Sesame Cream Cheese and Sweet Potato Cream Bread. I've noticed most of their breads either have custard or cream cheese fillings, and being a lover of both made it harder for me to resist each kind. "A must-try for all foodies out there. Think Mochi Bread w/ Cream Cheese Filling." "Generous amount of natural cheese on white bread." "Light and airy mocha bread w/ raisins and a hint of hazelnut flavor." "Amazingly delicious waffles made fresh with the best ingredients available." Aside from freshly baked breads, Tous Les Jours also has packed goodies and treats that are ideal to take home for families and loved ones. Tous les Jours offers the most beautiful and creative cakes around. Combine modern baking expertise and the freshest ingredients, and you'll have Tous les Jours luscious and delectable artisan cakes. Congratulations on the opening of your 14th store in the Philippines Tous Les Jours! It's like Bread Talk.. i love breads!! !